If you read my about page you’ll notice that I mention mysteries, which I don’t often review as my taste in mysteries isn’t always the same as others. However, it’s hard to go wrong with Sherlock Holmes and as I was in between seasons of the UK TV show Sherlock I picked this up to get my fix so to speak. This was a great buy from Amazon at 99 cents for the Kindle and the stories are in order and aren’t abridged, which I felt was important. I don’t want to read a book or story after someone who feels they ‘know better’ has taken a whack at censorship. Apparently there is another collection on Amazon that has 56 short stories for a few dollars more, but I didn’t see that one when I was out shopping around. On the whole, I was pretty happy with this purchase and really enjoyed reading it in between my sci-fi and fantasy books. 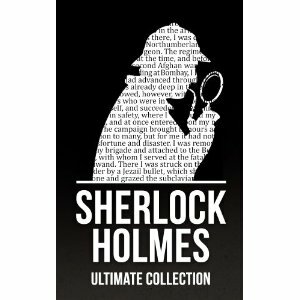 I was a fan of the old Sherlock Holmes movies when I was young, but had not read the actual books or short stories. For the time they were written these stories really cover some pretty gutsy territory with regard to social issues. For anyone who enjoys mysteries and hasn’t taken the time to read the stories, instead of watching movies like I did up until now, I think you will find a richness and depth that was not always present especially in the older versions of the movies. Anyway, lots more sci-fi and fantasy books on the schedule to be reviewed, but I thought I would share a review for this collection as I consider it to be a really good bargain and I thoroughly enjoyed it.